Moms and Tots: One half hour of dance with 2 year olds and their parent. Concentration is on having fun through movement. Technique is a "follow the leader" pattern using children’s’ music. We work on balance, stretching, movement through space and free dance. Creative Dance for 3 Year Olds: A one half hour class with 3-year-old students with an emphasis on an introduction to ballet and freedom of movement. Classes are small and intimate. We begin with a floor warm-up and move on to movement through space, and free dance using children’s music and classical music. Creative Dance for 4 Year Olds: A 45 minute class for 4-year-old students based on an introduction to ballet. First position, plies, relevès, tendus, bourrèes, passes and attitudes are covered along with free dance. Tap dancing is introduced during the winter session. A concert will take place at the beginning of May. Combination Ballet and Tap for Kindergarten and Grade 1 and Grade 2 students: A one hour class which combines an introduction to ballet and tap dancing. Weeks alternate. One week will begin with ballet for 40 minutes and the remaining 20 minutes will be for tap. The following week will begin with tap for 40 minutes and the remaining 20 minutes will be for ballet. There will be separate classes for each Grade level. There will be a dance concert at the beginning of May. Classical Ballet for ages 7 and older (Beginner, Intermediate, Advanced): Classical ballet classes based on a combination of techniques taught by qualified teachers. Dance concert will take place in June. 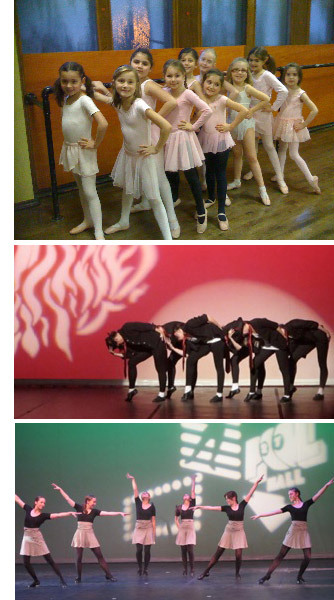 Combination Tap and Jazz Classes for Elementary School through to CEGEP Students: One-hour classes which alternate between Broadway styles of Tap and Jazz. Emphasis will be on one or the other each week. Dance Concert in June. Contemporary Dance for teens: Modern dance for students with at least 2 years of ballet training. Dance Concert in June. Hip Hop: Hip Hop dance style with Hip Hop Music. There will be a dance concert in June. Acro/Breakdance/Hip Hop: A fusion of gymnastics, break dancing and hip hop. A dance concert will take place in June.